Why carry more than you need? The Radix One is an ultra slim wallet designed to replace large and bulky traditional bifold and trifold wallets. The simple and functional design includes a strong silicone band that wraps around two polycarbonate plates to sandwich credit cards and IDs in the middle. The wallet is designed to hold 4-10 cards comfortably. The band also acts as a money clip to secure cash on the outside. 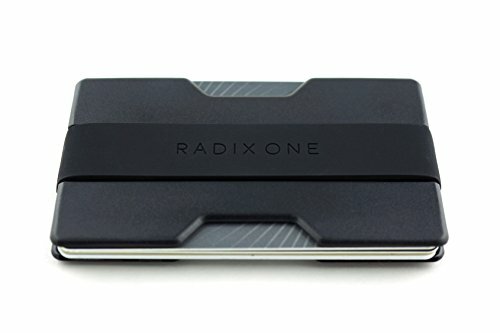 The Radix One is so slim you can easily slip it in a front, back, or jacket pocket without the burden of unnecessary weight or inches. Radix Products is a company dedicated to rethinking how everyday products are designed and used. Our everyday carry strives for simple, sleek, elegant functionality, and we back all our patent-protected products with a 1-year warranty. PATENT-PROTECTED SLEEK DESIGN - store both cash and cards in an ultra slim profile. If you have any questions about this product by Radix Products, contact us by completing and submitting the form below. If you are looking for a specif part number, please include it with your message.